There’s a chap lives at the end of our street in the corner house. Lovely bloke, and always smart. His shock of white hair is neatly combed and parted on the left (I don’t know if he uses ‘product’ or not!) and I don’t think I’ve ever seen him in anything other than collar and tie and V-neck pullover. The house paintwork and window frames are like new, and cleaned regularly and his garden is an embarrassment to the rest of us. Even in Winter time it is always tidy. Grass trimmed, earth dug and turned, and flower beds populated with Winter planting for a bit of added colour. In the Spring he plants out his seed-grown bedding plants and larger blooms which transforms his garden into a profusion of colour and perfume. And there isn’t a weed to be seen, even on the path. As I said, an embarrassment to the rest of us in the street. He drives a Hyundai i10. Always clean, regularly polished and even the alloys and tyres are shiny. He rarely looks up when I pass other than to nod or wave no matter what I’m driving whether it’s a large SUV or luxury car, flashy sports job or big van, but I made him fair jealous this week. 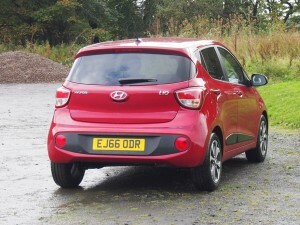 I was driving the latest model i10. He didn’t just look and nod. He stood up, watched and turned, still watching, as I drove smugly past. Happy with his lot and not in the least envious of other road users and their choice of transport. It must be nice to be so content with one’s lot in life, eh? Mind you, he has taste. 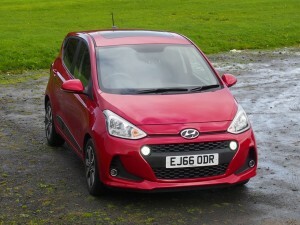 The Hyundai i10 is a cracking wee motor. The bloke who came up with that old saying, “good things come in small packages” might well have had Hyundai’s compact city car in mind. It might be small, but there are five seats inside the five door bodyshell although two adults may be a tad more comfortable in the back than three! Headroom is good and shoulder room adequate, but the trade-off comes when nipping in and out of traffic in busy town and city centres – and looking for parking spaces! It’s not quick, but it is surprisingly nippy once on the move. The 1 litre 65bhp three-cylinder motor might sound a bit underpowered, but in a car weighing a box of paper hankies more than 900 kgs, no-one really needs any more for snail paced commutes. If more power is needed then opt for the 1.2 ltr 86bhp four cylinder job – just don’t go expecting to haul a caravan around Europe with it. 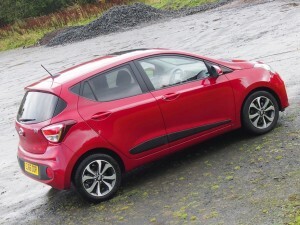 The one litre job revs like a Kenwood mixer while the slick-shifting five-speed ‘box makes progress easy and rewarding. 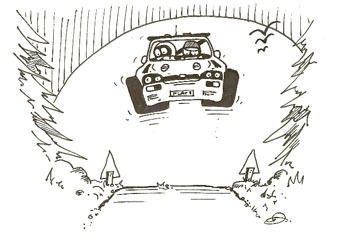 It’s no sports car but there’s fun to be had on twisting roads because the trick is to make progress without using the brakes, unless a cud chewing sheep steps out in front of you. It’s not really fast enough to threaten speed limits so if there is such a thing as making rapid progress at slow speed, this is it. 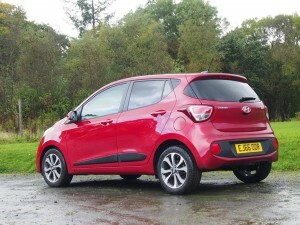 Inside, the i10 has all the home comforts you’d expect of bigger more expensive machines with a comprehensive dash display inside the binnacle dead ahead complemented by a touchscreen panel above the gearshift and full telephone/music inter-connectivity. It even has a full set of function controls on the leather rimmed steering wheel. The quality of the seats finishes off a well appointed and comfortable interior and the boot is just about big enough for two adults to go on holiday without putting the back seats down. What’s not to like? Nothing really. All the average driver needs in a small and economical package. I really liked it. And the chap at the end of our street? He loved it.